The Ireland boss feels there are positives to take from Monday night’s loss, despite watching his team being played off the park. O'Neill at the Stade de France. THE RESULT, AGAINST a French team littered with quality, was always going to be of secondary importance in this type of friendly. Ireland went down 2-0 in Paris on Monday night, and that was to be expected — given Didier Deschamps has some of the most expensive talent in world football at his disposal right now. With Kylian Mbappe catching the eye, in particular the home side fizzed passes about and looked like scoring every time they attacked. It’s hardly a new problem, but what will worry Irish fans, however, is just how unconvincing they were on the rare occasions they had the ball. 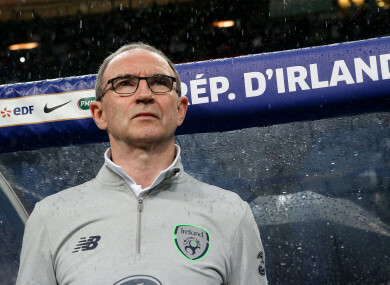 24% possession and just one shot on goal makes for depressing reading, but Martin O’Neill believes the fixture was a worthwhile exercise and a valuable experience for his players. “I thought we were naturally second-best this evening against a world-class team and that was possibly to be expected,” said the Derry man. “It was a really, really tough game for us – that was also to be expected – but I am really pleased that we have taken this fixture on because if you’re trying to aspire to something, that sort of quality that the French possess is something you would want. “While we are a great distance off that, I think the players can learn. We can look at the performance again at our leisure in the next 24, 48 hours, pick out the points we think we can definitely improve on. While Derrick Williams started at left full-back on his senior Ireland debut and enjoyed a decent game, Shamrock Rovers forward Graham Burke and Shaun Williams of Millwall were both introduced in the second half to earn their first international caps. “That will be a big experience for him [Burke], a big experience for Derrick Williams as well, an experience for a number of the players who were playing in an Irish shirt for the first time,” added O’Neill. “So from that viewpoint, it’s great, but it’s a great lesson for us tonight in what we’re trying to achieve. “Graham was naturally delighted to get a call to come on, and that was great news for him and probably great news for his club and maybe a boost for the League of Ireland as well. Goalkeeper Colin Doyle was guilty of failing to deal with Nabil Fekir’s strike from distance for France’s second goal but the management team were delighted to see him regain some of his confidence after half-time by keeping Les Bleus at bay. The game passed too many Irish players by, and in middle of the park, Alan Browne and Callum O’Dowda didn’t live up to do their reputations as young players tipped to become regular starters in the future, but more experienced players like James McClean and Jon Walters were out-of-sorts too. 19-year-old Declan Rice had a tough night at the base of the midfield, but the West Ham youngster’s manager expressed satisfaction with his contribution. “For one so young and not to have played that many games, he adapted,” O’Neill added. “He obviously gave his best – which he does anyway – and once again, with that sort of opposition that he’s playing against, that can only improve his game. Even at this very young age, to see what you have to aspire to. “I keep saying that, but that’s what it is — the benchmark. Very much at World Cup level, the very, very top of the World Cup. Email “O'Neill: We're a great distance off the French, but the players can learn from this defeat”. Feedback on “O'Neill: We're a great distance off the French, but the players can learn from this defeat”.